This Inflatable Boat Sealant is specially formulated for use with inflatable boats, rafts and tow toys. This sealant forms a bond with the interior fabric of the inflatable stopping or "sealing" slow leaks and inhibits future leaks from developing. In one easy step, leaks are cured from the inside which are virtually impossible to find from the outside. This Sealant is the only product of its kind which allows for future deflation of your inflatable (for storage, etc.) without the skin sticking to itself and making re-inflation virtually impossible. This is why this Sealant product has a 5-Star product rating and is used by the US Navy and Yachters worldwide since 1986. Inject the liquid sealant, equally distributed, into all the air chambers on your boat through the valves. Otr at least the ones you have slow leaks in. Turn the boat end over end and side to side to alloow the sealaer liquid to roll around inside the tubes, making sure that the entire interior is covered. It's sealed and as good as new! The time you used to spend pumping up the dinghy every few hours or days you can now spend with your first mate, working on your tan, fishing or just relaxing. Only one quart (1 bottle) is needed to seal up to a 12 foot boat unless you have many slow leaks. Read the "Usage Info" tab to calculate amounts required for bigger boats. If you have several slow leaks, consider buying 2 bottles and applying one coat, allow it to dry and then apply the 2nd coat. For larger boats, buy additonal units of the sealer. See the "Usage Info" tab to calculate amounts required for bigger boats. Your inflatable can be even more reliable than when it was new. 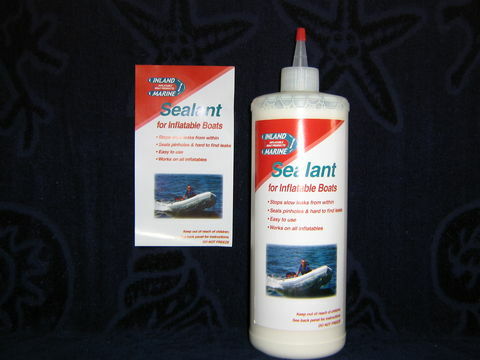 Don't sell it or discard it, use this sealant products to repair inflatable boats of all types. Inflatable Boats - small dinghies up to large RIBs. If you want to paint your inflatabel boat to give it a nice new look, consider using our Top side paint. 1. The basic rule is: 1/2 ounce of Sealant will cover 1 square foot of material. 2. The Formula for finding how many square feet of material there are inside your boat is: (Length of the Boat in feet) x 12 x 2 x (Diameter of the tube in inches) x 3.1416 -:- 288 = Number of ounces of Sealant needed to treat the boat. This number, divided by the number of air chambers gives the amount of Sealant needed in each air chamber. 15 x 12 x 2 x 22 x 3.1416 = 24,881.47 square inches total area. 24,881.47 -:- 288 = 86.5 ounces of Sealant will be necessary to treat this boat. Divide 86.5 by 3 air chambers and each chamber will require about 29 ounces. There is approximately 32 ounces in 1 quart. Sealant is use to seal leaks in your air chambers. Sealant will fix leaks you can find and those difficult slow leaks you cannot find. Sealant provides a strong bond that should last for years when applied per the instructions. Inflatable boat repair is accomplished easily with our sealant. If you cannot find the leak in your raft, kayak, tow toy, or dinghy you need to use this sealant. It will seal the leak(s) and keep you inflatable firm for years to come. This sealant can be use multiple times, so if your inflatable develops a new leak weeks or years from mow you can use the sealant again. How Can Something So Thin Be So Strong? The Sealant flows faster than water. The viscosity of the sealant was specially formulated by a chemist to repair inflatable boats and make them reliable in even rough seas. You might compare it to sheet of Kevlar. Kevlar can stop bullets, a 2 mil thickness of sealant can stop air up to 90 PSI. In tests, soccer balls were sealed and used in games. They were bounced on concrete and kicked hard without leaks. Since 1986 the sealant has been used by boaters around the world to repair inflatable boats of all kinds. The product is used by professional raft repair companies, US Navy Seals, and individuals for inflatable boat repair. Some manufactures even use this sealant to repair boats in their Quality Assurance Test. Slow leaks can be difficult or even impossible to find, our sealant will solve all you slow leak problems in minutes. When treating a boat for seam leaks, first locate the leak using the normal soapy water test. Inject Sealant into the air chambers in the normal manner. If the Sealant oozes out of the seam leak, immediately release some pressure by opening the air valve. DO NOT deflate the boat entirely, but keep enough pressure in it so that it keeps its shape. WIPE OFF THE EXCESS THAT OOZED OUT IMMEDIATELY AS IT WILL DRY VERY RAPIDLY and you will not be able to get it off except maybe with solvent. Let the boat stand for about 3 hours in order for the Sealant, to cure in the seam. After this time, re-inflate the boat and test with soapy water to see if the seam is completely sealed. If it is not, put only about ONE OUNCE of Sealant in the chamber and turn the boat so that the, Sealant again oozes out of the leak, then turn the boat so that the Sealant does not stay in that one spot. MORE IS NOT BETTER! It is better to repeat this process several times than to use too much Sealant in one application. Using this process, we have seen an eight inch seam leak sealed in three tries. The leak was eight inches long when the Sealant was first applied. On the second treatment it was about three inches long. The third try sealed it completely. Although it took some effort and some patience, it saved the boat. There are a couple of options available to those who own inflatable boats too large or heavy for one person to tumble. One option is to call several friends and ask their help. Then deflate the boat and inject the Sealant in each air chamber as outlined in the standard instructions. Re-inflate the boat to rigidity. Have two friends on each end of the boat. Raise the stern to about 45 degrees and hold for about 10 seconds. Lower the stern and raise the bow for 10 seconds. Turn the boat (rotate along its length) about five degrees and raise each end again. Continue rotating the boat 5 degrees at a time and lifting both ends until the boat has been turned completely over. THE SECOND METHOD IS EASIER AND CAN BE ACCOMPLISHED WITH ONLY ONE PERSON! Place the boat to be treated flat on the ground. Deflate the boat and add the Sealant following the standard instructions. WITH THE BOAT STILL DEFLATED, walk the Sealant around the air chamber, that is, step on the air chamber while it is deflated pressing the top half of the air chamber firmly onto the bottom half. Start at the valves and work your way to the ends until you are sure all the top half of the chamber has contacted the bottom half. An option to walking the boat is to use a garden type roller to help spread the Sealant. When you are sure Sealant has made contact with the entire interior of the air chamber, walk it again! Now you're ready to re-inflate the boat to RIGIDITY. Wait 3 hours, then inflate the boat to full pressure and check for leaks. In the unlikely event that there are still leaks, re-treat the boat using only 1/3 the amount used the first time. Make sure the Sealant gets to the leaking area. Do not allow the Sealant to pool in any one area. MORE IS NOT BETTER.